John Simone moved to New York City in 1987 from Toronto, quickly becoming a prominent nightlife photographer in the Club Kid scene, enshrining an era of unbridled creativity and irreverence that would go on to influence fashion and queer culture for decades to come. Simone began his career working for Club 10-18 (The Roxy), Details Magazine (including their influential nightlife column by Stephen Saban), Spy Magazine and The Village Voice. Eventually Michael Alig appointed Simone as chief photographer of Project X Magazine, photographing the likes of RuPaul, Divine, Suzanne Bartsch, Michael Musto, Leigh Bowery and other icons. “RuPaul: Evolution of an Icon” is a series of images that Simone photographed and curated showcasing the “wild and wacky” host and performer of the New York club scene before she became a household name. The exhibition opens June 14th and runs till June 29th, 2017 at Daniel’s Spectrum, and June 15th – June 18th at 562 Church Street, as a part of Nuit Rose. We sat down to chat with him about Ru, NYC nightlife, drag queens, and photographing New York’s most eclectic and fabulous. Who do you see as the heir to the throne of people like Leigh Bowery, Divine, and RuPaul who have defined a generation of queer iconography and art? There are a few people who are still around. I can be a bit critical in that I see a lot of things that are derivative, themes and looks, and I have to stop and say, “Well this is where it came from.” In the early to mid 90’s it became, if you weren’t some distinct look, that you were a nobody. But those weren’t the originals or “class of ’87”, as I call them – those were the second wave. They saw the club kids on The Geraldo Show, and thought “I wanna be like that” or “I’m already like that in Chicago, I’m going to go to New York.” But some of the best people from 30 years ago are still around too. For example, Tabboo, one of the original Pyramid Club drag queens, did a collaboration with Marc Jacobs last year. These people are sort of the elders of fabulousness and I would hope all of the younger people, if they have drag families or club kid families, have mentors like that for them. What are some intrinsic qualities of people that entice you to want to photograph them? If they’re presenting. In New York, especially at that time, every night was special, and drag queens and club kids never wore the same outfit twice. I don’t think I photographed RuPaul in the same outfit ever. It’s not the same as some contemporary drag which is all sequins and glamour. RuPaul is from the east village scene’s Pyramid Club where they would do the Sunday night Whispers Cabaret, and there was nothing ‘glamorous’ about it. 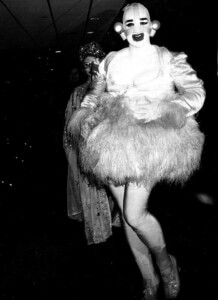 The first time I saw Leigh Bowery, he was coming down the long hallway of Club Savage and I was like, ‘what the hell is that!’ He was an inspiration, a sort of patron saint of the New York club kids. It’s instantaneous, it’s sort of like ‘this person is fabulous’, and my job was to photograph fabulous people because that’s what Details Magazine and all of the other magazines wanted at the time. In today’s social media saturated world, do you think the panache that used to be necessary for celebrity has become less common? No, it’s actually too common. Everyone has to have it. The bar has been raised so high. I have a photo of Michael Alig from back then in some sort of half-naked look, and I’m looking at the crowd and there’s no other club kids. There’s no other outfits. It wasn’t all gays either. It was an ecumenical scene. So then it was special to see Michael Alig’s or RuPaul’s look for the night. Some people think that it was ‘every single person was outrageously fabulous’ and that’s not how it was. The point is if everyone is a superstar, no one is a superstar. In the 80’s you had a chance to get into Stephen Saban’s column, and I might have been the one giving you that opportunity. But there was nothing else. 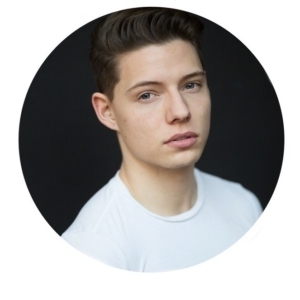 What is your opinion of the new era of queer visibility in popular culture (example: Drag Race), that is being normalized in the mainstream right now? There is a lot more opportunity now. But if you’re a youth coming out today, it has to be a better world. There’s more gay media these days. Everything is specialized for every niche. In terms of Drag Queens, when I came back from New York in 1990 to Toronto, all the queens were like Dynasty. All big shoulders, and sequins and glamour and lame. Who cares? You know, that’s what I don’t like about the proliferation of that kind of high glam drag these days. I’d rather the quirky drag queens. You’re not looking for glamour, you’re looking for entertainment. Why have you gravitated towards black and white and 35mm in your work? That’s what everyone wanted at the time, or at least what Details Magazine wanted. But I am so glad that’s what they wanted because, when I look at my work it has a classic feel to it. I did do colour, however, I did colour slides. I always had 2 cameras, so I would take colour pictures as well, but not as many. What do you think, has become the legacy in art and fashion, of the “golden age” of the club kids in New York City? I was deemed sort of the official photographer of the club kids, and I did celebrities, fashion and society parties, but it’s the club kids scene that is now ‘historical.’ But at the time, it was just a bunch of crazy kids. Stephen Saban and the downtown elite at the time tended to look down on the club kids, I couldn’t even get photos of those people into Details. 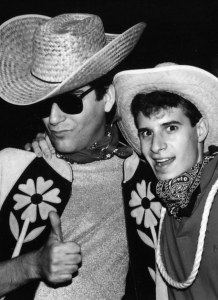 The international rave culture started with the club kids in New York City. They were the first sort of rave style parties, and Project X magazine who I photographed for, ended up becoming like a rave style guide. A few years after I left New York city, those same club kids were making huge amounts of money and appearances across America. Did you see the star quality in RuPaul when you were photographing her? “New York is a city of dreams. If you want to rule the world you must conquer its capital” (a quote from Quentin Crisp) and it was my job to know who everyone was. 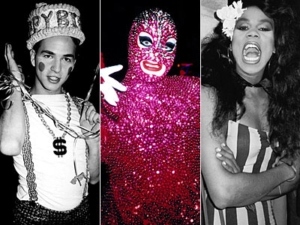 In my archive, the most photographed people are RuPaul, Leigh Bowery, Michael Musto, Michael Alig and Suzanne Bartsch. But trust me, back then nobody thought even RuPaul would go anywhere. The performance artist Penny Arcade once said “once you step one foot out of New York City, you’re a nobody.” Because everyone was famous in New York. At one point I went through a timeline of the photos I did of her, and you could see ‘these 7 photos one wig’, then chronologically she goes on to a different wig, and I would never see her wear that wig again, and in those 3 years she went through maybe 8 or 9 wigs. That’s why I call the show “Evolution of an Icon.” If you look at a lot of these photos of RuPaul, a lot of her outfits are actually tube skirts made from “stretch pants,” that’s what made it all so special in the 80’s; it was all DIY.